Performers include: Holly Marie Combs, Alyssa Milano, Brian Krause, Rose McGowan, Dorian Gregory, Shannen Doherty, Julian McMahon, Jason Simmons, Kristopher Simmons, Drew Fuller, Rebecca Balding, Ted King, and Kaley Cuoco. A supernatural series about the adventures of three young witches. After the death of their grandmother, Halliwell sisters Prue (Shannen Doherty), Piper (Holly Marie Combs) and Phoebe (Alyssa Milano) reunite and discover they are the strongest descendants of a long line of witches. The three use their powers to rescue others from evil supernatural forces until Prue is killed in battle. It is then discovered that Piper and Phoebe have a half-sister named Paige Matthews (Rose McGowan) who also has powers and joins their fight. Other recurring characters include Whitelighter Leo Wyatt (Brian Krause), police detective Darryl Morris (Dorian Gregory), and half-demon Cole Turner (Julian McMahon). With the help of Coop (Victor Webster), Piper & Leo travel back in time to change the events that have led to the deaths of Paige and Phoebe. First aired: May 21, 2006. You can read a detailed description, here and here. 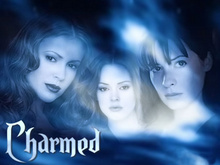 You can also listen to our Charmed podcast. • Because of later season budget cuts, executive producer Brad Kern has said that he and the show’s other executive producers, Aaron Spelling and E. Duke Vincent, took pay cuts to help keep the show on the air. In contrast to earlier seasons, demons were portrayed in purely human form. • Due to budget cuts, Krause and Gregory were cut as series regulars in season eight. Kern had to rework the show’s budget to find enough money for Krause to appear in a dozen season eight episodes (including the finale). Gregory’s last appearance was in the season seven finale and it was explained in season eight that his character had moved to the East Coast. Kern has said that he was not included in the series finale because Darryl couldn’t be fit into the plot. • Kern has said that Cole did not appear in the series finale because of McMahon’s busy schedule and the expense. • Footage and images of Doherty as Prue were not included in the last episode because of (surprise, surprise) budgetary issues. Kern has noted that the Screen Actors Guild stipulates that, if a performer’s image is used in an episode, the performer must be paid for the appearance. Using images of Doherty would have meant that other performers appearances couldn’t have been afforded.